Eczema and psoriasis of the scalp can be difficult to live with if not properly treated. While they may never go away completely, certain solutions can help to ease the irritating symptoms associated with them regularly. These serious skin conditions can cause itching, redness, inflammation, and more. So, a solution like Wild Naturals Eczema & Psoriasis Cream needs to stand up to these negative symptoms. You may not initially think of using a cream on your scalp for these conditions. However, it works just as well as anywhere else on the body. Wild Naturals makes this cream easy to apply to the scalp if you’re struggling with eczema or psoriasis. It offers a gentle formula that is highly effective. Using a topical solution, like a cream is one of the best ways to treat the symptoms of eczema or psoriasis of the scalp. It allows for penetration directly into the skin. So, symptoms can be soothed faster. 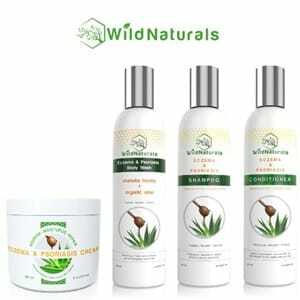 Wild Naturals takes their cream one step further by using the best natural ingredients. This ensures they’re offering a safe product that you can feel good about using often. In this review, we’ll cover more about Wild Naturals Eczema & Psoriasis Cream. It’s one of many soothing solutions on the market, but is it the right one for you? Use the following ratings for the product as a guide on the questions about it that matter most to you. Why Is Wild Naturals Eczema & Psoriasis Cream the Best? One thing Wild Naturals prides itself on is the formula. Their key ingredient is a medical-grade honey, called manuka honey. Manuka honey has antibacterial properties that help to heal the skin and keep it healthy. Manuka honey also helps to moisturize and keep the skin supple and soft. Psoriasis often leads to itching and flaking, so moisturizing ingredients are important. 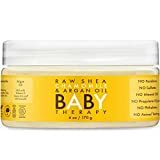 Along with the honey, this formula also features ingredients like cocoa butter, designed to alleviate itching and inflammation. The specialized blend of vitamins is essential for the effectiveness of this cream. Vitamin E helps to repair damaged skin. Vitamins B2 and B5 promote healing, nerve function, and increase the overall protection of your skin. Vitamin A also helps to reduce inflammation. They are all designed to protect the skin of your scalp in one way or another, preventing harmful skin conditions from taking over completely. Wild Naturals is very clear about what each of these ingredients does within the formula itself. They specifically state how each one works to heal dry skin, repair, and protect. This can create confidence when you’re considering a purchase. When you know exactly how each ingredient in a cream works, you know what you should expect in every use. Perhaps the most interesting thing is that it contains no added water. While many treatment products use water as a sort of filler, Wild Naturals uses aloe vera instead. Aloe vera not only helps the cream to penetrate into the skin. It also provides instant, cooling relief on inflamed and red areas that are constantly itching. Each active natural ingredient in this formula serves a purpose. Wild Naturals is quick to share those purposes, so it’s an effective cream without any harmful chemicals. CLICK HERE to Check Pricing Info or Reading Customer Reviews on Amazon! This cream offers a 15-in-one formula. With such a short ingredient list, it’s fairly simple to take a look and determine if you have any pre-existing problems with any of them. Because all of the ingredients are natural, harmful side effects are rare. If you do experience any negative side effects after using the cream, it’s likely that you have an allergy to one of the ingredients. Talk with your doctor immediately after use if you experience a negative reaction. They should be able to test if you indeed are allergic to one, or more ingredients. If allergies are not a factor, it’s very unlikely that you would experience any harmful side effect. There are no harsh chemicals or artificial fragrances. The formula is designed to be light, and non-greasy, but is still able to penetrate deeply into the skin for fast results. While the product isn’t approved by the FDA because it is 100% natural, they do ensure that the manuka honey they use is government-certified. The pH balance of this formula is 5.5. This allows it to be absorbed into the skin quickly and safely, for the fastest results possible. When you’re dealing with the harsh symptoms of eczema or psoriasis, you know that itching and pain can be a huge problem. Finding relief quickly is important, which is exactly the focus of this product. You can also use it as a daily moisturizer or to simply protect your skin as a barrier. You don’t have to wait for dry scalp, or a nasty skin condition to occur to reap the benefits of this organic cream. If you’re more prone to flare-ups of particular skin conditions, it’s a great preventative cream that can protect your scalp from severe outbreaks. Different products react with sensitive skin in different ways for everyone. As a precaution, always test a small area of your skin with this product to make sure it works the way you expect. However, this cream is specifically designed for people who deal with sensitivity on their skin. Because it uses only natural ingredients, it’s easy to recognize what might have a reaction with your skin. It’s also a mild formula, despite its effective ingredients. You can rub it directly into your skin several times a day without worry. It won’t leave any heaviness or greasiness behind. If you do have sensitive skin, you may even find that it helps to soothe it. Not only does it help to heal skin conditions of the scalp, but it works as a healthy boost for your skin around the clock. The value rests in its effectiveness, price, and their money-back guarantee. It is more effective than many shampoos and conditioners designed for dry scalp. Because it uses all-natural ingredients to penetrate your skin, you can expect results quickly and safely. If for some reason, you don’t achieve the results you want, they’ve got you covered. Wild Naturals offers a “love it or your money back” guarantee with each purchase. They recognize that everyone’s skin is different, and may react differently to certain ingredients. Their main goal is to create a product that works for you. So, if it doesn’t, you can receive a full refund with no questions asked. Their guarantee is transparent. While the cream costs more than some of the best psoriasis shampoos on the market, it also has more features to heal and provide comfort. Plus, because of the short and easy-to-understand ingredient list, you can feel confident in putting it on your skin. The advantages of the product greatly out way the disadvantages. If you can get over the natural scent, there are so many benefits to using this regularly. You can continue to use your favorite cosmetic shampoo and conditioner, such as Christina Moss Naturals Organic Shampoo, to mask the scent. Or, try natural oils like lavender. More people are turning toward naturally-based formulas for scalp conditions. This is because they are safer to use. They don’t contain chemicals that could harm your skin or dry it out even more. Even if you have a sensitive scalp, all-natural ingredients can help to soothe it and not cause additional irritation. 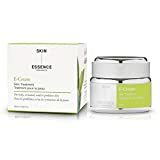 This cream is designed to help with a variety of different skin conditions. It also works well as a daily moisturizer. 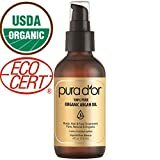 So, whether you want to get rid of dry scalp, or you struggle with a skin condition like eczema or psoriasis, it’s an organic solution you can feel good about using. When you see the results and feel the soothing relief, you’ll feel even better. 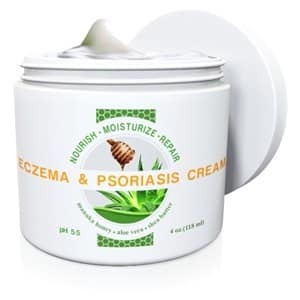 CLICK HERE to Buy Wild Naturals Eczema & Psoriasis Cream on Amazon!